Flavia has been selling tamales and champurrado on the corner of 28th and Pulaski for six years now. She’s out by 5am to serve the early risers and back in again as soon as her food sells out, often in as few as three hours. She prefers the winter because what she sells is warm and sweet, but she does fine year-round—well enough to support her two children back in Mexico and to put one through college. Though her business has garnered hundreds of faithful customers, it is not legal. The Chicago municipal code offers only two kinds of licenses for pushcart vendors. One authorizes the sale of uncut fruits and vegetables, the other the sale of frozen desserts that have been “manufactured, prepared, or wrapped in a licensed food establishment.” But down 18th Street, 26th Street, and Blue Island and within pockets across Chicago, one finds troves of carts loaded with fixings for tacos, tamales, and elote, with containers of chili-sprinkled pineapple and coolers of aguas frescas. None of these foods are permitted by either city-issued license, but the carts have long been community staples. Two years ago, Flavia was fined by the police for selling food without a license. Despite the setback, she decided to keep at it. Vending food allows her autonomy and flexibility that she did not have as a factory worker; it allows her to speak Spanish, her native language. And, with no restaurants in the immediate vicinity, her cart is convenient for residents who head to work before the sun rises. Flavia’s incident with the police was enough to encourage her to start attending meetings of the Asociación Vendedores Ambulantes (AVA), a Little Village based organization that advocates for vendors’ rights and street vending regulation reform. The AVA was founded in 1992 in response to a spike in police harassment against vendors, which at its worst culminated in police dumping bleach on vendors’ carts. The organization seems to have become more active in the last half decade under Vice President Vicky Lugo’s guidance—she joined five years ago and is the only member who speaks fluent English in addition to Spanish—and with the recent uptick in interest in food policy. The organization currently has around eighty members, a fraction of the total vendors in Chicago, which a conservative estimate from the AVA puts around fifteen hundred. In 2012, the AVA joined forces with the University of Chicago Law School’s Clinic on Entrepreneurship, a branch of the libertarian civil liberties law firm, Institute of Justice. Earlier that year, the Clinic had run a campaign called My Streets My Eats. The campaign advocated for reform of restrictions placed on pushcarts and food trucks alike, but ultimately only secured legal status for food trucks. On those grounds, the AVA and Institute for Justice formed the Street Vendors Justice Coalition. Rather than pushing for a new license, they revised the existing ordinance for mobile frozen dessert vendors. (The new ordinance replaces “dessert” with “prepared foods”). If approved, the revisions will effectively render pushcarts legal–so long as the vendors are licensed, the food is prepared in a licensed kitchen, and the carts are up to the standards of the Health Department. The revised ordinance proposal offers a win-win situation for vendors and the City of Chicago: a few strikethroughs and added words would legitimize pushcarts as micro-businesses and would likely increase city revenue through licensing fees. But the ordinance, introduced into City Council in May of 2014 through the support of Aldermen Roberto Maldonado and Willie Cochran of the 26th and 20th Wards, respectively, has been sitting in bureaucratic limbo for the past year, leaving its supporters questioning its future. But the ordinance has not been disregarded by the City Council according to Maldonado’s office. The alderman’s Chief of Staff Kathleen Oskandy said that the Mayor’s Office has been meeting with the Latino Caucus over the last few months to iron out minor concerns. The current license fee stands at $275; Maldonado originally proposed that the fee be reduced to $100. After hearing back from the mayor’s office, final changes will need to be approved before the ordinance is brought back to members of the Latino Caucus not in attendance at earlier meetings. Oskandy did not know how long it would take for the ordinance to be officially approved. In the meantime, “e.a.t.” spots–newspaper stands turned “healthy food kiosks” in the Loop–have closed within just months of opening. The stands had been the first recipients of the new Emerging Business License, which, according to a city press release, was created “in order to allow new, innovative businesses to launch when activities don’t fall under the current license structure.” The “new, innovative business” in this case had the same objective as pushcart vendors have always had–to sell prepared foods; but the stands fell victim to the harsh winter, according to the e.a.t. spots Facebook page. The revised ordinance also has the potential to resolve conflict between city and local policy. According to Lugo, the severity of law enforcement against vendors depends not on city law but on the local police force and alderman. Pilsen vendors, for example, may sell most prepared foods without any trouble. 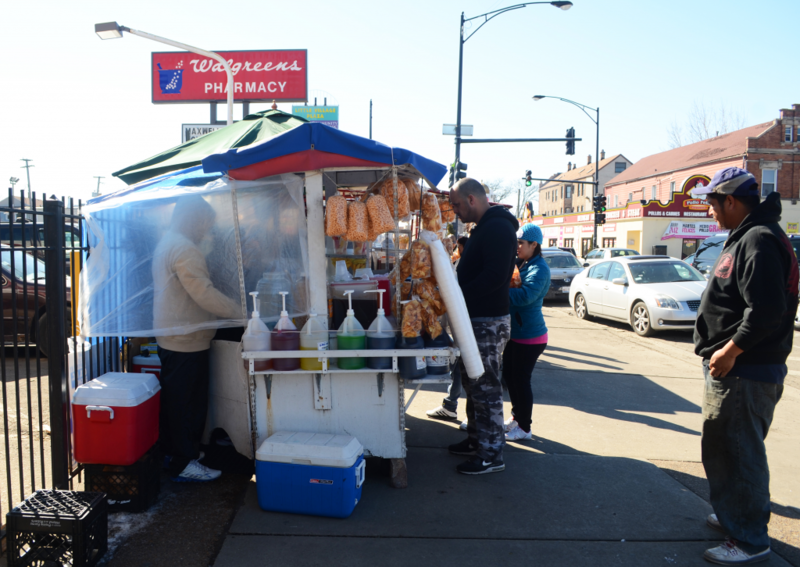 Regulations in Little Village are more strict; vendors are generally permitted to sell cut fruits, aguas frescas, and snacks, but not tamales or tacos. Lugo maintains that it was a change of police commander five years ago that rooted out all street vendors from the Back of the Yards neighborhood. But you would be hard-pressed to find any of this detailed in the city code. Inconsistencies of this kind may explain why Flavia has only been given one fine in her six years of vending, while Rosemary of Tacos de Cabeza, stationed in southern Little Village, went as far as to secure a peddling license to avoid harassment from local police. Maneuvering City Hall was not easy, she laughed, but the police don’t bother her now that she has a peddling license. But the fact still stands that, until City Council approves the prepared food license, her tacos are no more legal than Flavia’s tamales and champurrado. As elected officials work on finalizing the ordinance, the AVA continues to meet weekly in its president’s Little Village garage. Only three vendors have shown up to the first meeting of the year and the coolers in the back of the room run intermittently, drowning out voices, but Lugo speaks clearly and there is a nearly tangible optimism about the progress made in the last several years. They discuss several potential locations for shared kitchens before Lugo directs the conversation towards concerns that have been circulating about the revised ordinance. Food safety is the major concern expressed outside the vending community. However, the Street Vendors Justice Coalition worked closely with the Health Department when revising the ordinance to ensure mobile vendors are held to the same standards as restaurants. And a recent study published by the Institute of Justice concludes that mobile food vendors in seven major American cities were consistently awarded marks from the Health Department equal to or higher than those of brick-and-mortar restaurants. Some concerns come from vendors themselves. Due to the ordinance’s new regulations, vendors serving prepared foods would be required to have a cart of non-porous material, which generally cost $3,000 at bare minimum. Flavia, whose cart is currently not up to those standards, says that an investment in a new cart is a worthy trade-off for the city recognizing her business as legitimate. But vendors in more pushcart-friendly neighborhoods are less willing to fork over thousands for new carts. Another concern is that street vendors may have an unfair advantage over brick-and-mortar restaurants, which require much more initial capital and cannot move from place to place. When Lugo brings up the pushcart-restaurant concern up for discussion at the AVA meeting, a vendor suggests that perhaps street vendors just make better tamales than restaurants do. This is met by laughter and agreement from other members. Before wrapping up the meeting, Lugo reminds the present members that many successful businesses had small beginnings. She cites the department store chain Saks 5th Avenue, whose founder was an immigrant and began his career as a cloth peddler. Of course, the point of legalizing pushcarts is not to uniformly push vendors towards commercial success. What would happen, she jokes, if, upon the passage of the ordinance, all mobile food vendors decided to open up restaurants? What matters is that vendors have that same possibility to achieve success from small beginnings and, more importantly, the right to earn an honest living; that vendors are recognized as providing a valuable service to Chicagoans and contributing to community vibrancy. It’s all within reach–it’s just a matter of waiting for the ordinance’s passage through City Council.